Why argue about a cheap potato finca in Tenerife? Could this farmstead be turned into a holiday home? Was property investment Tenerife in this case worth the money and the hassle? This finca in Tenerife seemed to have much potential. Indeed, all sorts of fincas have been turned into marvelous holiday homes. Some of them are the ideal property investment on the island. 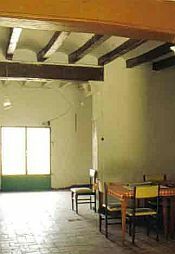 Many a finca has even been turned into a small hotel with often not more than 5 bedrooms. Large hotels that were former farmsteads are more rare. But, they do exist in Tenerife. The small farmstead with the heavenly views which had caught our attention was a potato finca, hence a potato farm. 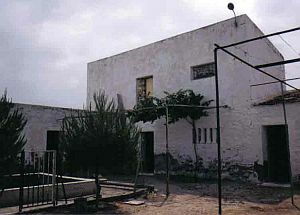 The sale's prize for the 2000 square meter finca was in today's currency about EU 50000. However, the potato finca building would cost quite a bit to repair and to renovate. It might have set us back a good additional EU 30000 That amount would have bought a new roof, kitchen and bathrooms. It would also have paid for labor, in those days. By the way, the owners were desperate to sell. They needed money for cancer treatment. We could have squeezed the sale's prize. That, however would have been a nasty thing to do. The potato finca in Tenerife was pretty high up, right there in the mist belt. We found it during our 1997 Tenerife vacation when searching for a holiday home in Tenerife North. How did the finca get its water? A forest was above the small farm. Its Canary pines supplied water, which read up here. Also, a spring was near the farm. Its water tasted delicious. What I will never understand, though, is that those free for all Tenerife fountains have no tabs and the water gushes onto the ground. By the way, the Tenerife pine needles of our finca smelled much better than bath bubbles with pine scent. It had not occurred to me then, that fog also meant forest fire danger, especially in the case of this potato finca. In fact in 2007, farmsteadts which were dangerously close to forests were burned by Tenerife bush fires. However, farm fire damage may be avoided. It's actually much easier than one would think. The sight from our small finca in Tenerife was very similar to the one of the photo above. Many fincas were scattered around ours. By the way, I've never found the place of the farmstead again since our holiday in 1997. I met the agent the other day. He told me that it was above Cruz Santa. 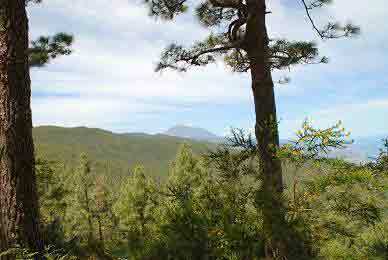 That is on remote slopes of Los Realejos. Some other little detail about our potato finca comes back to my mind. There were two lemon trees in front of the kitchen and living room. I remember the glossy, green leaves and huge, bright yellow lemons. The ripe fruit gave off such a strong, refreshing perfume like I never smelled before. The lady gave me a couple to take back to our hotel. Well, those are some of unforgettable surprises of Tenerife country holidays. This potato finca was charming, indeed. Well, I suppose that all fincas in Tenerife have something special. Nevertheless, I had to argue with my husband because of this isolated, small farm. But, not so much because of that fact than for other reasons. Did you know that the Canary pines are part of indigenous trees and plants which are fire resistant but, that they even need it to thrive better in the long run? 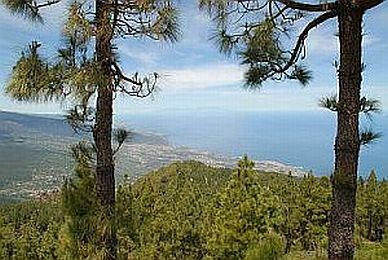 Sonia implied that farm winters could be unpleasant on steep Tenerife mountain slopes. not why we come to Tenerife", she said. worry me. My hubby would use a heater when I never needed one. He likes to sit by an open fire with only a t-shirt on. He hated jerseys. 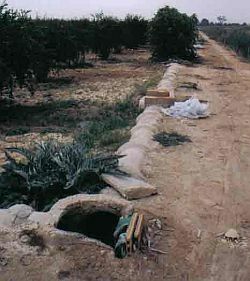 The photo above shows a simple finca, very similar to the one we had found. Only, ours was covered with a light-green paint on the outside. All those farmsteads had one thing in common. They had land. My husband liked land. So do I. With land I mean property with space, not just 500 m2 including the buildings. A farmstead or, finca in Tenerife has more than that, normally. Therefor, fincas are almost always a good property investment for Tenerife because, land is the best investment. in Tenerife this finca was. having muesli on your breakfast table outside. of scattered farmsteads on hills. "Hey Mrs", he called me... "You can turn up the music by this rural house without molesting anybody. Indeed, those were all good arguments. My hubby thought, he had the last word. Ha! "What you are saying, dear Peter, makes all perfect sense. For people who want to settle on a finca", I said. "Mind, we don't know either what it implies to do major changes to a finca (farmstead) in Tenerife", I implied. In fact we had no clue about renovation in this part of the world. The roofs were leaking for starters. The ceilings were stained ugly-green by mildew. The bathrooms were very primitive..
Everything inside and outside the farm building was Spartan. 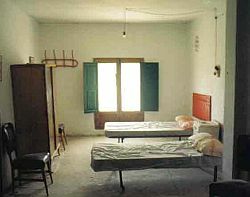 Too much time and, money was needed to give "our finca in Tenerife" a basic standard. It, certainly, might have been worth renovating, had we stayed on. How would we employ workers? The next day, my hubby did not say often "no problem". The day before, he had found it easy to organize workers for the finca in Tenerife. Why? No problem... In Tenerife, the locals would help, he said. Had he some doubts by now, that nothing was that easy? But, how supervise artisans while far away on another continent? That was our case. That was the big problem. Yes, it's often better to do things in construction more slowly. But, being too far away and, wanting to do Tenerife finca building alterations was not a good idea. This was not just a case of simple renovating. I know that my hubby would have smoothed out eventual hurdles the Latin way. That concerns finca building regulations which needed smoothing out with an inspector. The idea was to invite him for a delicious lunch cooked by my hubby. Then an excellent good vino (wine) was a must, too. My husband might have come to check up on the farmhouse renovations while coming to the island on business. But how often? Sometimes, on the spot decisions might be necessary to buy special tools or building material. We might run out of money and might need a finca mortgage. Besides, how does one communicate with rural house building workers when not speaking Spanish? Some of them might not even know how to read and write. 'What about the potatoes 'in your finca'?, was my next question. 'The farm neighbor of our finca in Tenerife will take care of that', was my husband's answer. 'Look, why not', my husband added. 'In Murcia the co-ops handle the farming for you, if you so wish.. That might also be an option for farming while away from the island. Co-ops exist in Tenerife, too. neighbor doing it? ', hubby added. Above, right: A Spanish ancient water channel, constructed during Moorish occupation..... Plastic pipes that are running above ground are, usually, seen on a finca in Tenerife. This country place for potatoes was special. It would have been ideal for a relaxing Tenerife vacation. It was also lovely for eating outside under the trees. The finca had this 'cool' country flavor. However, eventually, I managed to talk my hubby out of his fancy for 'his potato finca in Tenerife'. Now, I bless the day when I achieved that. Why? My 'better half' passed away, 4 years later. I would not have liked to be on a little farmstead all by myself. It would never have been the right holiday home on the island for us, anyway. Also, there was no time left to hunt for another finca in Tenerife. Friend Richard was dreaming about a Tenerife finca with viticulture a proper vineyard. That now, sounded more interesting! Why? Richard' idea was living after retirement on a farm to produce his own wine. So, for time being, the hunt for our holiday home in Tenerife will still go on. One more week, until deadline... We shall have a great holiday in Tenerife at the same time, for sure... We know how... We are the four of us, we are friends. From finca in Tenerife back to fincas in Tenerife with many photos.